When you first see the coastal town of Perros Guirec, situated in the northernmost department of Brittany, in north-west France, you could be forgiven for thinking that you are wearing rose-coloured spectacles. 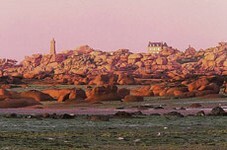 For the place is built from the naturally rose-tinted granite that is the natural rock of the area, and which gives the Pink Granite Coast its romantic name and image. Of course, you could also look at it through the bottom of a glass of rosé wine... to double the effect! Perros Guirec is a popular seaside resort, and has lovely beaches and great opportunities for water and beach sports. 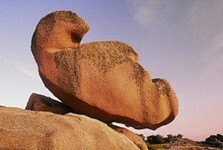 It is also known for its incredible natural sculptures among the pink granite rocks which have been moulded by the sea into some amazing shapes and patterns. There are three large sandy beaches suitable for families. Plage Trestraou is probably the best for swimming and sunbathing, as it is more sheltered than the others and receives full sunshine. The Plage Trestrignel is equally lovely, with a wild, natural charm, but is more wind battered than its calmer neighbour. Just a little off the coast is a tiny island, Sept Île, that serves as a bird sanctuary for some rare seabirds. The coastline is also peppered with tiny inlets where small boats can take refuge from the wind and waves, and above it all is a pretty landscape of wild sea grass, heather and yellow gorse. Perros Guirec has an attractive marina and a bustling harbour, and it is in this part of town that you will find a great selection of waterfront restaurants and bars where you can relax and enjoy the delicious fresh seafood and soak up the Breton atmosphere. There are a good number of restaurants elsewhere in the upper town too, and they vary from cheap and cheerful snack bars to the finest of gourmet dining... take your pick to suit your mood and your pocket. If you like a gamble and feel that Luck might just be a lady for you, then you will be pleased to find that there is a casino in town. Perros Guirec has all the amenities you will require, and there are numerous shops and schools as well as health services, banks and sporting facilities. In fact, when it comes to sports you are likely to find yourself spoiled for choice, as there is so much on offer. Adventurous sports are available too! Tennis is available, of course, as is boules and petanque, but you could be a little more adventurous and try scuba diving, windsurfing, sailing or jet skiing. You might even like to have a go at the very speedy sport of sand yachting that is so popular here. You can fly into Dinard's airport with Ryanair or Air Aurigny, or you could choose to take the ferry to St Malo. Both places are near enough to the town to make travelling easy. Train travel is a little more complicated as you have to make a few changes along the way, but the station at nearby Lannion makes it possible to travel by rail should you so wish. Property in this part of Brittany is quite pricey, and particularly so in towns such as Perros Guirec that lie right on the coast. Despite this, however, property here usually proves to be a good investment as prices hold up well due to the continuing popularity of the area, and its easy access from the UK. It is a desirable location for holiday makers too, so if you wish to earn some extra income from your property by renting it out when you are not using it yourself this is usually possible, and rental incomes are high, especially in the summer season. Do you know Perros Guirec better than we do? Do you have photos of Perros Guirec? Perros Guirec is located in north-western France on the coast. It lies in the north-west of the Côtes d'Armor department. Access: By air: Fly to nearby Dinard with Ryanair or Aurigny Air Services. By boat: The ferry port of St Malo is the closest to the resort. By rail: The nearby town of Lannion has a rail station with links to larger towns. Economy: The economy is led by tourism, although there are also a number of small commercial enterprises registered. Interesting fact: In the original version of the Phantom of the Opera it is in Perros Guirec that the young Vicomte de Chagny pulls Christine's scarf from the sea.